I recently hosted two live broadcasts on Facebook about digital scrapbooking. The first focused on the “state of the craft” and how digital fits into the larger industry. The second connected my new rules of scrapbooking to digital crafting, focusing on how the choices you make can lead to feeling unmotivated. Digital scrapbooking is the creative process of uniting photos, words, and supplies using your computer. The end result can look much like a traditional scrapbook page or quite different, depending on the scrapbooker’s tastes and preferences. Where can I buy digital supplies? What software should I use for digital scrapbooking? Most digital scrapbookers user Adobe Photoshop or Adobe Photoshop Elements to create scrapbook pages. Photoshop is more sophisticated and can be purchased for as little as $9.99/month. Photoshop Elements (commonly referred to as PSE) is more user-friendly and does not require a subscription payment. How do you use layered templates? Are there apps for digital scrapbooking? Your computer is best suited for creating digital layouts, but the Project Life app is a popular solution for creating pocket-style pages. How do you print digital pages? Completed digital pages are generally saved as a JPG file and then printed with a mail order service like Persnickety Prints. Many digital scrapbookers prefer to print individual pages rather than waiting to print an entire bound book. Where do you store digital items? Digital scrapbook supplies are files, generally JPGs (digital paper) and transparent PNGs (embellishments). Thus you would store them like any other files on your computer, in folders. I prefer to store my photos, digital supplies, and digital pages separately. Hybrid has always been a catch-all to mean a lot of different ways of using your computer for scrapbooking. Printing a word art overlay on a photo is technically hybrid. Today I’m seeing the most hybrid work being done with printing Project Life cards. How does Lightroom fit into this? Adobe Lightroom is photo management and editing software. While you can use this software to organize digital scrapbooking supplies, and even create photo books, you can’t create layered scrapbook pages with Lightroom. 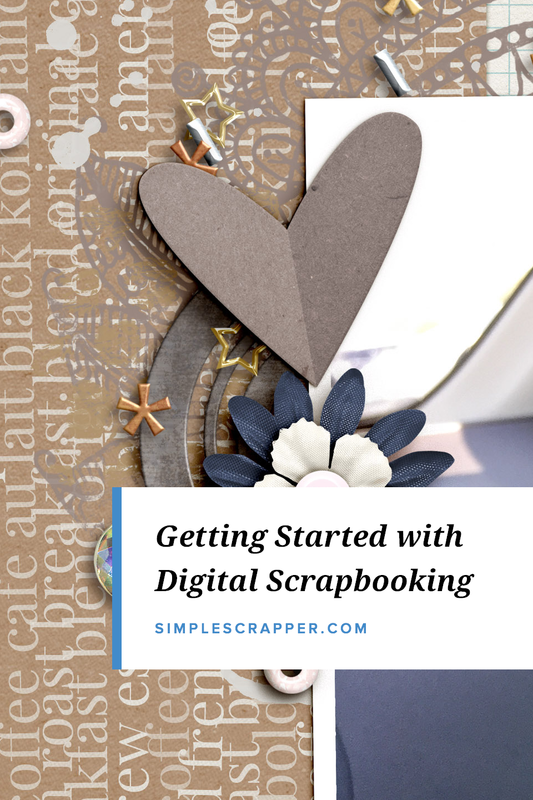 How do you start digital scrapbooking? The best way to begin is by practicing and finding additional answers as you need them. If you would like to take a class, I recommend Digital Scrapbooking for Beginners at Scrapaneers. It’s free!